Loved this review of my book by Ellie Marrandette and wanted to share here with all of you! Happy Friday! 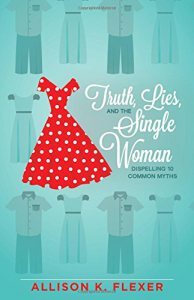 What did I think of Truth, Lies, and the Single Woman, the new book out by Allison K. Flexer? In a word: Relatable. It didn’t matter that I was several decades removed from the average age group targeted in this short 158 page Christian non-fiction book; I could still identify with the expressed thoughts that complicate our personal growth throughout the years. From the very first paragraph, this book grabbed my attention and held it to the very end! Instantly, my memory traveled back to grade school, where I suffered through the indignation of usually being the last one chosen for a team. Painfully, I could relate. Since I was an uncoordinated mess during those years, I believed the “Lies” that I had no worth. No one wanted me for I was imperfect.